In a recent Red Bull interview Bruno Hoffmann talks about his move to Berlin to live with fellow Red Bull rider Matthias Dandois. For two months Bruno discovered endless new spots to session in the city. Red Bull spoke to him about his “Back to Berlin Streets” edits and learn more about the rough style of the city, and what he got up to there. 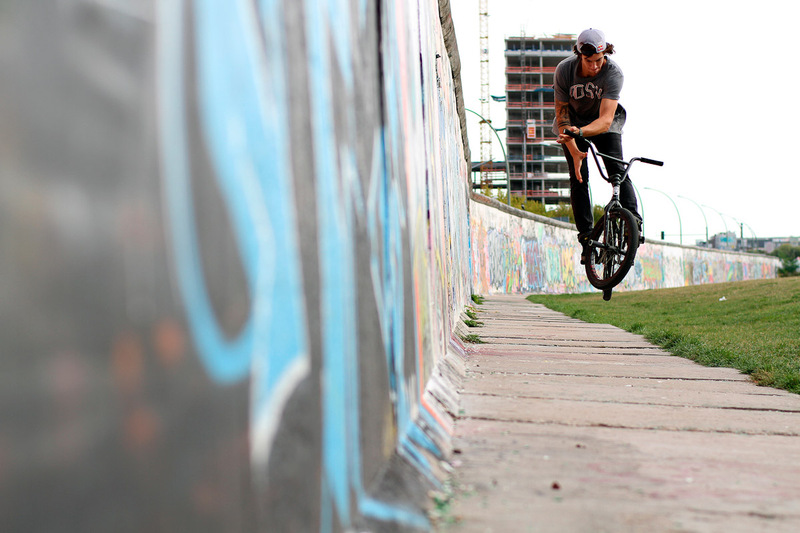 Read on for some words from Bruno and some an extra video of Bruno and Matthias riding Berlin. After leaving Berlin as a child Hoffman harboured a dream: an apartment in the centre of the city leaving him free to ride. These edits follow him and his friends on their adventures in the city as they discover a series of exciting spots to session, whilst Mayol filmed the action. Red Bull: How did you get the idea for your project ? Bruno Hoffmann: I came to me that we never found the right time ride in Berlin. Maybe Mellow Park and at the playgrounds, but otherwise not really … The idea was so obvious. RB: So Berlin has a special meaning for you, because you were born there? RB: What was the project about for you? BH: The city has so much to offer that I had the urge to take the capital of Germany in one go and see it all. Sure it was great, a sweet apartment in the middle of the city, so I could always invite friends. It meant we could head out every day discover new places and just ride. That was absolutely amazing and a great experience! RB: So who dropped by to ride with you? BH: Well, the list is long … and foremost, my good friends Mario, Kicza, Slayer, and Janek Lantschner, but my brother and his crew from Siegen. Matthias Dandois and Anthony Perrin came all the way from France. There were too many people to list, but in the film you will see who else was there. RB: So Berlin has a lot to offer when it comes to BMX spots? BH: Oh yes, because Berlin has a lot of great spots. Although not necessarily in the center, rather in the suburbs. That was a bit annoying to always have to go out … In the end it was worth it though, especially exploring the architecture of the eastern parts – if only for the chance to ride rails, rails, and more Rails! RB: Can you compare it with Barcelona? BH: No, not really, to be honest. The cities are absolutely different and so is the particular vibe. Spot wise Barcelona certain has some incredible places, but Berlin can compete well. As for other cities I see London now not as the next BMX hotspot – just because everything is so far apart, but the city still has its own charm and I love the rough style there! RB: What were your three best street spots in Berlin? BH: This is difficult to say, after two months I ended up traveling to a different spot every day! But in Marzahn, everything was absolutely sick! We went to so many cool spots, making it impossible for me to pick just three … Sorry! RB: Travelling you must stay in a lot of hotel, what difference did it make to have your own apartment? BH: I felt after just a few days at home, that was great. We could chill out when we wanted and it meant we could go out in the city and party which was a blast, though it made it difficult to give up the apartment when the project was over. RB: Did you do all your own chores too? BH: Ha Ha. Yes, I did ! Since the apartment was on the 7th floor was, it was too annoying to go down for each snack, so we just bought stuff once a week so we could cook after riding and just chill. RB: Your final words on the project? BH: I’m really looking forward to, and I hope everyone enjoys it as much as I did.